I am a work in progress. I reflect on the past, predict the future, and live in the present moment. Nearly everything I do is a work in progress. Some things just make more progress than others! Over the past few years I have been preparing resources for my readilearn website. It’s slow going, slower than I expected, but I’m getting … somewhere. Even when the website launches it will be a work in progress as I update old and add new resources. In a flurry of activity, with the intention of completing additional resources as development of the website nears completion, I experimented with making a product promotional video. My intention is to make a number of these, possibly explaining the use of each interactive resource. Doing so is far more time consuming that I had expected. Below is my first attempt. But please don’t let that word “first” mislead you into mistakenly thinking it was my only attempt. I lost count of the number of takes and couldn’t believe how difficult it was to utter just a few short sentences. While I am sharing it, please consider it a work in progress. Making promotional videos for my products is something I need much more practice with. an ability to adjust future attempts according to feedback provided from the past. I learned a lot in making this video, perhaps more about what doesn’t work than what does. But eliminating what doesn’t work is crucial in finding out what does. For example, I learned after repeated attempts on both, that selfie videos recorded with phone or iPad just weren’t going to be good enough. I learned that neither of the software programs for making videos I owned would allow me to achieve what I wanted on its own. I needed to combine recordings from each. After many trials I finally made something that at least has the semblance of an attempt. Included in my passion for learning is a passion for learning about learning: how we learn, why we learn and the conditions that contribute to our learning. I am fascinated by learning that occurs at all ages, but particularly during early childhood. In the process of repeated attempts described above, I responded constantly to feedback provided, and adjusted each new attempt accordingly. Feedback is necessary for learning. But perhaps more important than the feedback is the response to it. Hopeful of getting some other feedback, I shared the video with my family on the weekend. They made some helpful suggestions. But perhaps the most interesting feedback, about feedback, was that given by my four-year-old granddaughter, G2. G2 watched the video with her mother and immediately wanted to play the game. I was delighted, of course, and opened the resource on the iPad for her to use. She had no trouble manipulating the objects to make the ice creams and quickly made a few combinations. When I asked if a mango with strawberry on the top was the same as, or different from, a strawberry with mango on the top, she confidently explained that they were different because “this one’s got the strawberry on the top and this one’s got the mango on the top”. She went on making combinations. After she’d made about ten combinations she asked, “Are we finished yet?” I said, “We can finish whenever you like.” I wasn’t using it as a “teaching episode”, simply as something fun for her to do. She asked again, “But are we finished? You know –“ and she indicated for something to happen on the screen showing that we had finished. Suddenly I realised that she was wanting feedback from the program to tell her that she was finished, that she was successful; perhaps some bells, whistles or fireworks. Because I designed the resource as an open-ended teaching episode, for use by a teacher with a class rather than by individual children, the resource does not have any inbuilt feedback. The feedback occurs in the discussion between teacher and students. What I intended as a teaching episode became, for me, a learning episode; thinking and learning about feedback. she wished to continue until she received that feedback. during play she decides which activity she will take up and when she will finish. G2 has a good balance of activities with home and Kindy; indoor and outdoor with a variety self-selected and self-directed imaginative play mixed with cooperative activities including reading, board games and screen time with a variety of apps. With such variety she receives feedback from many sources including self and others, as well as from manipulation with real and electronic objects. I think her question “Are we finished yet?” was related to use of the specific device and type of activity (game to her), not indicative of a generalised need for feedback from outside. But what of children who are more engaged with electronic games, have less time for self-directed activity, and fewer opportunities to engage with others? Will the need for feedback from an outside source overtake the ability to provide feedback for self? I hope not. I believe the abilities to self-monitor, self-regulate and self-determine to be extremely important to life-long learning. What do you think? Thank you for reading. I appreciate your feedback. It is important to me! Please share your thoughts about any aspect of this post. This entry was posted in Alternative / non-traditional education, Early childhood education, Education, eLearning, Teaching resources and tagged early childhood conversations, early childhood learning, feedback, growth mindset, learning, self-direction, teaching and learning, teaching episodes, Teaching Resources, videos on February 26, 2016 by Norah. My gorgeous grandson has just lost his first tooth, an event much anticipated and causing a great deal of excitement. In the months leading up to the event I had wondered how the family might mark the occasion and if the Tooth Fairy might visit. Though I shared the myths of Santa Claus, the Easter Bunny and the Tooth Fairy with my children when young, as adults they have debated the ethics of perpetuating these myths with their own. As a teacher of 5 – 7 year olds it was not uncommon for me to encounter gappy grins and lost teeth through the course of the year. Mostly children would arrive at school proudly displaying a new gap, or a new tooth peeking through. Sometimes the tooth would dislodge at school and there would be great excitement. I would carefully place the tooth in the centre of a tissue, fold the edges down around it and sticky tape below the tooth to make a little “tooth fairy” to keep the tooth safe for the return home. Sometimes the children would discuss how their families marked the occasion of a lost tooth. Although there were children from diverse backgrounds in the classes I taught, I don’t remember any great divergence from the, to me, traditional tooth fairy story. When I was a child, I put my tooth in a glass of water and placed it on the kitchen windowsill. The following morning, if I was lucky (for sometimes she’d forget), the Tooth Fairy would have been and left me a shiny silver threepence. Some children I taught put their teeth under their pillows, some in a special box by their bedside, but what most had in common was the fact that the tooth had been taken and replaced with a shiny coin. Sometimes, when a child lost a tooth, we would read a story such as What do the fairies do with all those teeth? or Moose’s Loose Tooth. While I was contemplating what the response might be to my grandson’s lost tooth, I read about a book called Throw Your Tooth on the Roof: Tooth Traditions from Around the World by Selby Beeler with illustrations by G. Brian Karas. I wondered if it would be a suitable gift to mark the occasion and went ahead and ordered it. I wasn’t disappointed. The book briefly describes traditions from many cultures and countries around the world. While the Tooth Fairy’s visit and gift of a coin is familiar to those of us living in the UK, US, Canada and Australia, it is not so familiar to all. In Mexico and Venezuela a mouse replaces the tooth with money. In El Salvador a rabbit does the same. In Guatemala it is El Ratόn. The title of the book comes from the tooth traditions of Botswana and the Dominican Republic. In some countries children receive coins, as described above, or a gift in exchange for the tooth. In other countries they ask for a new tooth. In Costa Rica and Chile the tooth is made into an item of jewellery. What surprised me was the great variety of traditions, of which I have mentioned only a few. The result is fascinating. Thank you Selby for being curious and asking a question that elicited so many interesting responses. Thank you also for selecting some of the hundreds of traditions and compiling them into this lovely book that enables us to find out a little more about each other; some things that are the same and some that are different. I’d be delighted too if you, esteemed readers, shared your traditions in the comments. You find a loose tooth in your mouth. I am disappointed that, in all the years I was teaching children in the “loose tooth” age group I hadn’t ever thought to investigate different traditions. Although I took many opportunities to celebrate the diversity in the classroom (I’ve shared some of those here), I wonder what other opportunities I missed. If I was still working with year one children this book would be essential to my collection and sit alongside another favourite for discussing diversity and acceptance, Whoever You Are by Mem Fox. I am pleased I found it in time to gift to my grandson to mark his first missing tooth. 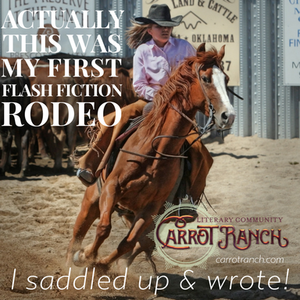 This week at the Carrot Ranch Charli Mills is also talking about diversity and has challenged writers to In 99 words (no more, no less) write a story of a character who is diverse. Who is this person? Does this character know, accept or reject being perceived as different? As writers, consider how we break stereotypes. Tell you own story of “otherness” if you feel compelled. Or, select a story of diversity, such as rainbows revealing gold. How is diversity needed? How is your character needed? I am compelled to add my voice to Anne’s recommendation. It is a fascinating, challenging and enlightening read. In a comment on her post, Charli stated that diversity is in the small things, not just the big. I believe she is right. It is the attitudes and actions we incorporate into our everyday lives that can make the big difference in another’s world. I’m sticking to my tooth theme for my flash with a wish for recognition of commonality, acceptance and respect. Richard Crisp’s book goes a long way towards helping understand what drives us, and why. The invisible wall was a fortress built of fear and prejudice. On either side a child played alone. The rules were accepted without question. Then they saw each other, and a challenge was born. At first they kept their distance, staring across the divide, until scolding adults bustled them away. Curiosity and loneliness won over fear as they mirrored each other in play. One day they drew close enough to touch, but hesitated. Simultaneously they bared their teeth, each proudly displaying a gap, in the middle on the bottom, a first. Surprised, they laughed together: more same than different. This entry was posted in Early childhood education, Education, Flash fiction, Picture books, Stories and tagged acceptance, commonality, culture, difference, diversity, Early childhood education, lost tooth, Tooth Fairy, tooth traditions on February 23, 2016 by Norah. 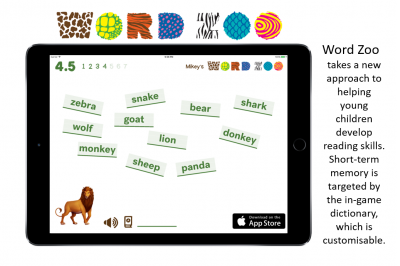 This entry was posted in Education on February 19, 2016 by Norah. To say it is important for our wellbeing acknowledges its anthropocentric value. However, I believe, as I know Charli does too, that its value is intrinsic with significance beyond its importance specifically to humans. Wilderness areas are the lifeblood of our planet, of all species. They are just as beautiful and just as necessary whether any human lays an eye on them or not. I am not a hiker, definitely not a hunter, and have never been one to spend a great deal of time in the wilderness. However, I have a deep appreciation for the beauty and value of wilderness areas. I strongly believe in the importance of protecting them to ensure the health of our planet and the survival of our, and every other, species. Sometimes I wonder if our survival is deserved with the seeming disregard many of us have for our Earth, but I am a meliorist and place my hope with future generations. To ensure this meliorism is well-founded, we need to nurture in young children their innate interest in and love of nature. There is probably no better way of doing this than through first hand experiences observing nature in wild spaces. Share with children their wonder, be intrigued with their explorations and extend your own understanding through their discoveries. 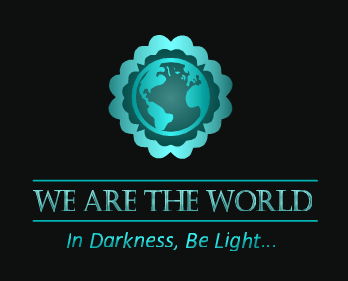 At the same time develop in them an appreciation of and respect for our earth and its gifts. Encounters with nature don’t always have to occur in large nature reserves in distant places. 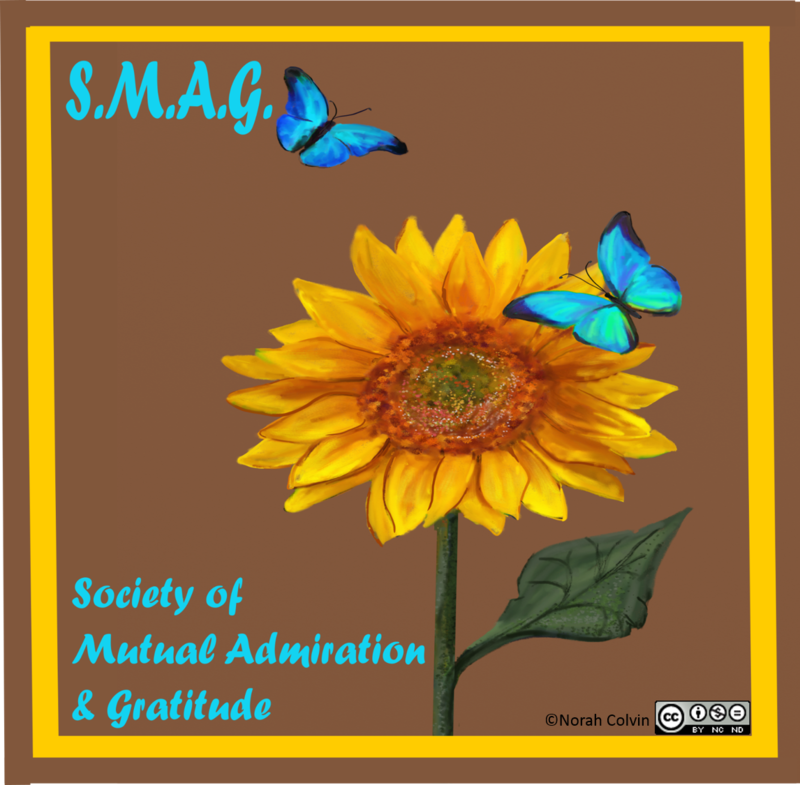 In fact, a real appreciation of nature is an attitude, a way of thinking about the world and can be fostered as a part of daily life with observations in the backyard, in wild places along the roadside, or in a pot on the window sill. Books also serve a purpose in nurturing an interest in the world around us. In addition to books of beautiful photographs, fiction can also be used. Last year in a series celebrating Australian picture books I wrote a post about collage-artist and author Jeannie Baker who shares her passion for the environment through her picture books. In 2004 Jeannie published a companion book to Window called Belonging, which, in 2005, also received a number of awards, including one from the Wilderness Society. I think these messages, together with those shared in Charli’s post, are important for children to not only hear, but to see modelled by adults in their everyday lives. I am happy to say that members of my family are proactive in the ways they care, and advocate, for the environment. I have much to learn from them. For my flash I drew upon a recollection of a place visited in my much-younger years, a favourite place for calming mind travel, and Charli’s recognition of the benefits of wilderness areas to our psyche, to our very essence. Charli’s challenge was to In 99 words (no more, no less) write a story about wild spaces. Is it a wilderness or a patch of weeds in a vacant lot that attract songbirds. What is vital to the human psyche about wild spaces? Bonus points for inducing something cute and furry. I’ve also tried for the extra points. I’d love to know what you think. This entry was posted in Early childhood education, Education, Flash fiction, Picture books, Quotes and tagged caring for the Earth, Early childhood education, education, environmental education, Flash fiction, wild spaces, wilderness on February 16, 2016 by Norah. 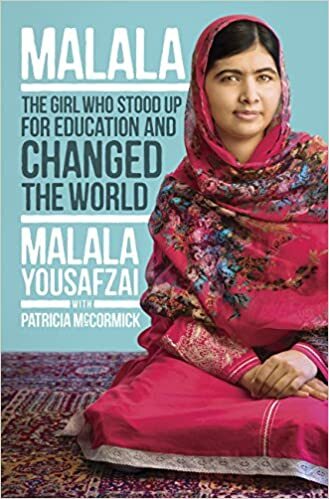 This week I have been listening to Malala The Girl Who Stood Up for Education and Changed the World by Malala Yousafzia with Patricia McCormick (Indigo). She calls world leaders and people everywhere to take action and make education their top priority, for all the children of the world, not just their own children. I think one of her most influential teachers must be her father. Thank you for reading. I’m sure you have found Malala’s story just as inspirational as I have. 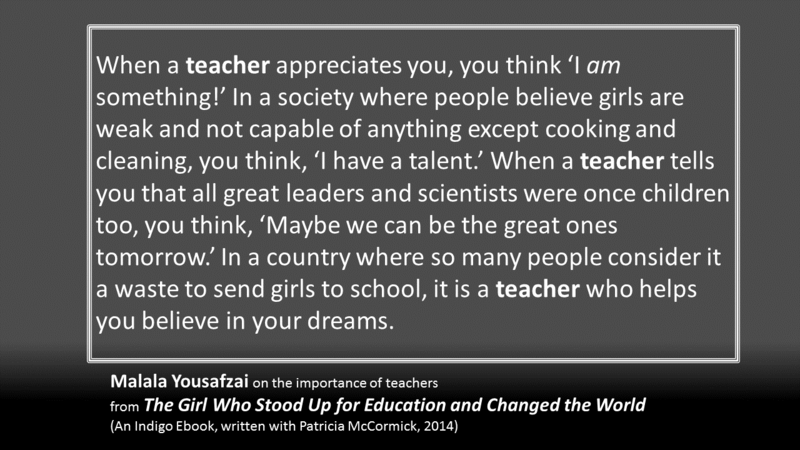 This entry was posted in Affirmations, Alternative / non-traditional education, Education, Favourite reads, Literacy education, Quotes, Traditional schooling and tagged education, Malala Yousafzia, Nobel Peace Prize, teachers, teaching on February 5, 2016 by Norah.